Fourth grade Lesson Inquiry with Mixed Numbers - How far did she run? Inquiry with Mixed Numbers - How far did she run? SWBAT solve problems involving a fraction and a whole number by using an fraction model. In this inquiry based lesson students collaborate to solve engaging real world problems in order to add or multiply mixed numbers to whole numbers. This lesson requires students to work through some productive struggle in an engaging fraction word problem. This lesson is very much inquiry based since I have not previously taught my students how to add mixed numbers or multiply mixed numbers with whole numbers. Students have had prior experience adding fractions with like denominators, experiences with what mixed numbers and improper fractions are, as well as experiences with multiplying fractions with whole numbers. I like this problem and presenting it in video format for this lesson. I believe that when students are given opportunities to listen, talk and write about mathematics, they must organize, reorganize and consolidate their mathematical thinking and understanding. They must also analyze, evaluate and build on the mathematical thinking and strategies of others. In this lesson the use of mathematical language as well as the productive struggle the problem poses, helps students gain insights into their own thinking and develop and express their mathematical ideas and strategies, precisely and coherently, to themselves and to others. To begin this lesson, I tell students that I have a problem for them to work on and solve. I then explain the format for how they will solve and work with this problem. Students will work within a structure I call 2, 4, 6, 8. First, they will watch a video of another teacher giving a problem to work on. This is the video students watch for their problem to work on. 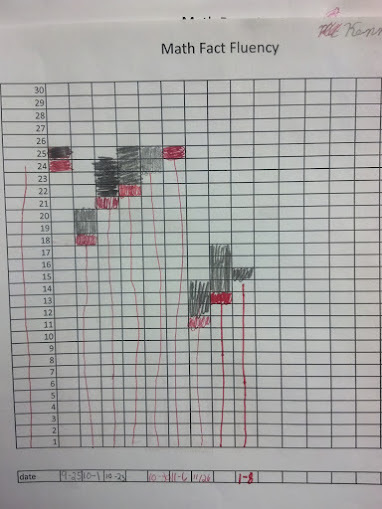 After the video is played twice, students then have 2 minutes of their own think time. During this two minutes the room is absolutely quiet and students try to make sense of the problem and what is being asked. Some students may write things down and begin trying to solve the problem while others may just spend the time drawing or sketching ideas about the problem. After this initial two minutes, I reset the timer for 4 minutes. For the next 4 minutes, students will discuss the problem with their learning partner. They may talk about how they could solve it or discuss parts that are confusing and unclear. When the timer goes off, students stop talking and begin the next step. For the next step, I reset the timer for 6 minutes. During this 6 minutes, students again work independently to SOLVE the problem. Their goal is to come up with an answer to be able to discuss with their table group at the end of 6 minutes. For the last step I reset the timer for 8 minutes during which students talk as a group. During the 8 minutes each person in the group should present his/her ideas and solution to the problem. If students do not have a solution they then present their ideas about strategies they used or would like to use. All group members should be heard. When the timer goes off after the 8 minutes, I then ask one member from each group to summarize the groups findings and solutions. I record the solutions on the board so then as a whole class students can begin to look for similarities and differences among solutions. In this video you can hear and see a student during the 4 minute partner session from the above strategy. The student believes his answer to be wrong. Listen in as his partner gives him advice about what he could do when the time begins again for the 6 minute independent work time. In this photo, you can see a student's strategy. While it's not completely correct, this student's work does shoe that she knows to add the wholes. She didn't add the fractions, but I did hear her partner talking with her during the 2, 4, 6, 8 strategy asking her why she didn't add the fractions. At that moment, she did realize that in order to solve the problem she would need to add the fractions as well. In this photo, you can see another student's strategy. She adds the whole numbers up incorrectly, but she definitely has the right idea. One of the highlights of my day was listening to this student explain her thinking. 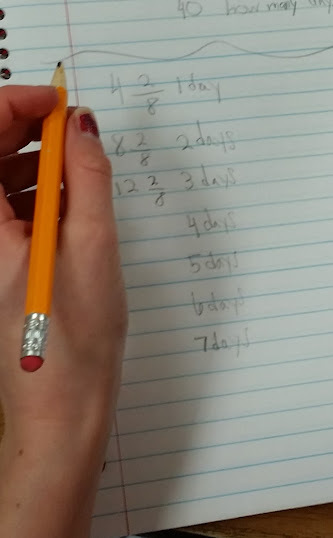 The numbers on the left are the days that the teacher runs in a week. This student is also a student that tends to struggle and gives up easily with word problems. She demonstrated great perseverance with this video problem and pride in her solution. Setting up a classroom climate in which students are comfortable making mistakes takes patience and diligence. Before this student presented, I did tell her that she didn't have the correct solution but I wanted others to see her thinking. Note: I chose to video another teacher in my school giving students a real life scenario for several reasons. One, in the past, videoing other members in my school has been a huge motivator for my students and increased their perseverance in problem solving. I felt like many of my students lacked perseverance in yesterday's lesson, so I wanted to make that a goal for this lesson. Also, by providing students a video problem, they must work on their listening skills. Listening is a skill that all of my students could get better at, so this is a nice way to remind them how important listening is. One of the most important reasons I like videoing my colleagues besides adding to my students perseverance is that it really helps to build my school community. When my students see their former teachers, or teachers they see in the building, they begin to realize that every educator in the school believes in their ability and wants them to succeed. Not just me, their math teacher. Often times educators think that the students in their classroom every day are "their" kids or "their" students. Videoing others really helps my colleagues see that my students aren't just mine for this year, but that they are really "our" kids, the schools' kids. I think this is a very valuable component of building a community as well as successfully implementing the Common Core State Standards.The Common Core State Standards promotes collaboration among students and among educators. For the wrap up of this lesson, I ask one member from each table group to summarize their table's strategies and solutions. As students share and summarize, I record solutions and strategies on the board for all to see. Then I lead a whole class discussion focusing on the strategies students used, not the answers they came up with. This is difficult for my students, still! It is during whole-class discussion that students explain and justify their ideas and strategies, as well as challenge and ask for clarification from their classmates. However, coordinating whole-class discussion in a timely manner, in order to develop students’ mathematical understanding, is demanding. To be successful with this, I must coach students on how to participate in mathematical discussions and develop from and expanding on students’ mathematical solutions to make explicit mathematical concepts and strategies related to the lesson’s goal. During the wrap up, I help students make connections between the repeated addition and multiplication of a whole number and a fraction as well as modeling as a way to make sense of problems. Note: Most of my students did not have time to answer the second part of the question about how many days would it take to run 40 miles. I will revisit this component in tomorrow's lesson.